I have been taking a time off blogging lately due to heavy workloads both in the office and at home. I am taking on extra assignments to do at home that means the already little free time I used to have is diminishing. Anyway, hope the effort that I am putting right now will create more flexible and free time for me in the near future. This is just a little update on me!! 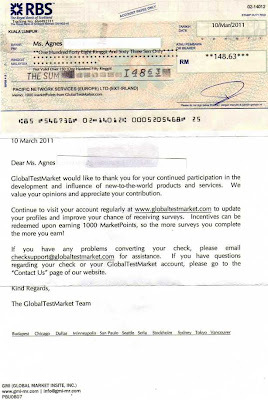 I am delighted to find a mail from Global Test Market in my post box this morning, a mail that I have been waiting for since 4 - 6 week ago when I claimed for my reward points. A RM148.63 cheque for taking surveys, not bad at all!! Bills and dues come through the mail box most of the time, receiving money through mail box definitely gives a different kind of feeling, delighted and more! This is the first time I received rewards from taking survey in a form of money. Taking surveys is just another form of earning some extra pocket money, it's will take a while to accumulate enough points to check out/redeem. 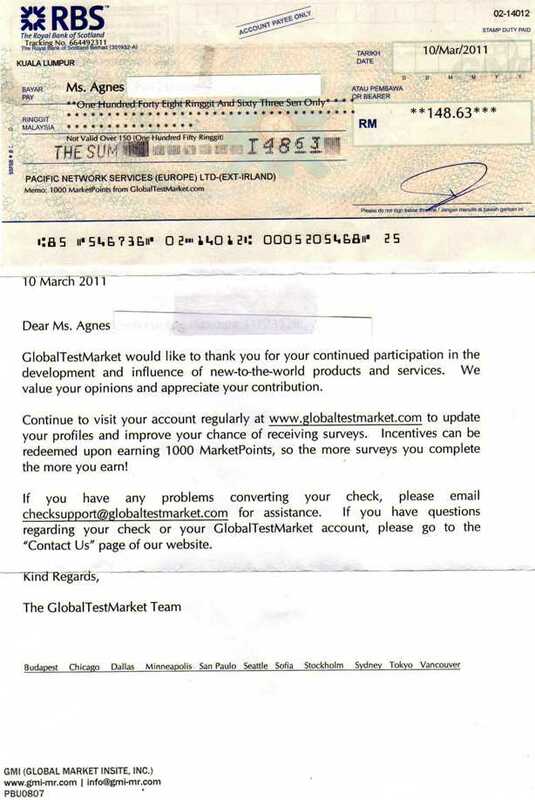 The minimum redeemable points from Global Test Market is 1000 points which is equivalent to the amount that I received.